You want to work to play? That was exactly what I told the boys before I brought them down to KidZania Singapore. In case you are new to KidZania, it is NOT the latest playground in town ( though kids would dispute that). Instead you will be stepping into a multi award winning interactive indoor edutainment center where children can experience the world of adults in a mini replica of a real city. 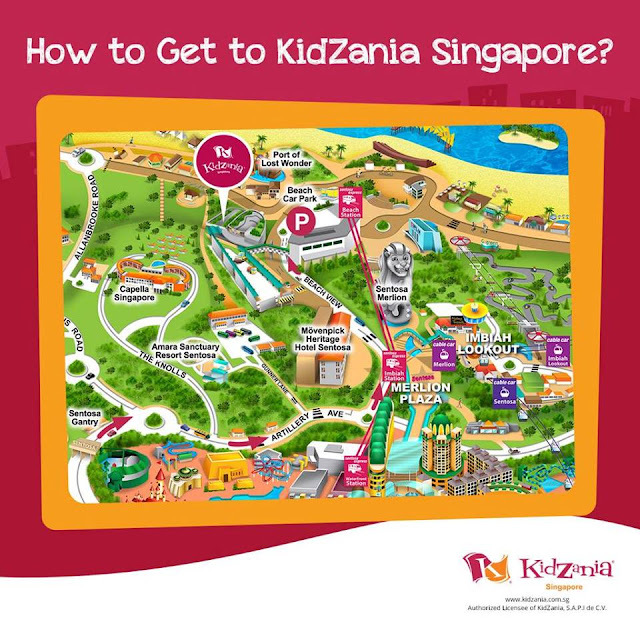 You can get your discounted tickets to Kidzania from Klook here! Targeting children age 4 and above, this is the place where children live out their aspirations in KidZania. Here, children can engage in various role-playing activities that will allow them to earn KidZos , make a living and get rewarded at the end of their experience. The 7600 square metres facility is located in Sentosa. If you are taking public transport, take the Sentosa Express from Vivocity to the Beach Station. Alight and look for Palawan Kidz City development and take a short stroll towards it. Once you spotted an aeroplane poking out of the building, you are within steps to a whole new world. If you are driving , park at Palawan Beach carpark and follow the directions above. To gain entrance to KidZania, you would have to first check in to the world inside. Fashioned like the airport ticketing terminals, here you would either purchase a ticket or exchange your online tickets for the essential check in items. Upon checking in, you would receive entrance tickets as well as money. Well , not exactly money, but 20 KidZos and a debit card with 30 KidZos loaded. In addition, you will have to wear a watch tag which is used during play as well as security. Each watch tag is link to the parent's tag and the child cannot check out if there is no matching adult tag to go with it. Playing in KidZania is actually a very simple concept. You can take on a variety of jobs that either pay you in KidZo or charge you in KidZo. Thereafter accumulate your earnings at the end of the day and go to shop for a gift. There are no restrictions to the kind of work you decide to do. Simply put, KidZania is a place where kids play to work. There are over 60 jobs in KidZania. Finding your way around can be challenging on your first visit , so do grab the map at the check in counter to navigate your way around. In case you are confuse by some of the words spoken by the staff at KidZania, do not fret, you have not gone bonkers. KidZania has their own language and expression. Honestly for a first timer, you would probably be overwhelm by the numerous activities and would probably be lost at where to best start your career. Here are 15 handy tips for you to enhance your experience in KidZania. KidZania officially opens it's doors at 10am. However judging from the queue when we were there, I would suggest to be there by 830am. Else processing time might take a while and you might end up gaining entry only a year later. For weekends, forget about getting a ticket at KidZania. With a limit of 1500 people at any one time, tickets get sold out pretty fast. So book online for faster entry. Book with Maybank credit card and get an additional 10% off. Once you are in there, head straight to the bank first to activate your child's debit card. Queues do form throughout the day and you might end up waiting in line for up to an hour just to activate it. You could use your credit card to withdraw cash at ATM to spend. At the end of the day, you could also save the money earn for your future trips to KidZania. If you intend to frequent KidZania ( which you probably would) , apply for a PaZZport and become a CitiZen. Visit the PaZZport office on the mezannie floor to sign up for B*KidZanian. a one time registration of $18 applies per PaZZport. Each PaZZport will last till a CitiZen turns 17 years old and is valid at other KidZania facilities around the world. You have 3 levels of CitiZenship to advance. At each level. you will enjoy more benefits at KidZania such as more earnings in jobs and discount in shops. Do plan for at least one activity that involves food. The price of the ticket includes these activities and the food that comes with it. You can choose to make pizza, a chicken burger or a healthy bowl of soup. Considering you would probably spend a whole day at KidZania, this would probably be lunch for the kids. There are jobs that have lesser queues. We would strongly suggest you take them up especially when Kidzania gets too crowded. Waiting for an hour per activity can be draining on the kids and also limit their chances at earning more KidZo. Do check the signage on each station . Like in the real world, different jobs have different remunerations. To maximise your returns, go for the high paying jobs. In order to boost your earning, go to the university first to get your degree. With a degree , you can earn extra 2 KidZo or more for selected jobs. The signboard will let you know the capacity of kids allowed, the duration of the activity , the age suggested as well as the earnings. Do pay attention to them as some jobs may require additional qualification such as university degree, insurance , minimum age or height to participate. Signs for queues are not so obvious. Some of the signs are on the floor itself. There are a few fun activities that you can participate. However to participate in those activities, you would have to pay a fee. We do suggest to leave these activities for the later part of the day or the next visit. That way your KidZos would not disappear after 3 activities. This is probably the hottest job in KidZania. Everyone wants to be a pilot and the queue can get awfully long. We recommend that this be the first stop when the kid starts their career. Join the Nickelodeon Acting academy and role play as Nickelodeon characters such as Teenage Mutant Ninja Turtles or Spongebox Square pants. There is a capacity of 8 kids per session and each session last for 30 mins. Each session is conducted by 'Zupervisors' who has experience in performing arts and undergone studies at Nanyang Academy of Fine Arts. The kids would don Ninja turtle gear and rehearse for their moment of fame at the impressive 2 storey 109 seater theatre. Since the audience would be mostly made up of the children's parents, it will be a delight to perform live in front of your family and love ones. The role pays well too with each kid earning 10 KidZos. During school holidays, visitors will also have a chance to attend meet and greet session with Nickelodeon characters and take home exclusive goodie bags. With all the above, how can you say no to being a fire fighter? Most kids love pizza especially one that they make themselves. Being a chef is a must do activity in KidZania and the best part... it's their lunch too! Fancy taking a quick tour around KidZania and get paid for it. Courier service is the way to go when you get to visit various part of KidZania while delivering your package. It's also great to see your child interact with the adults. Given that there is a time limit to complete the job, it is quite interesting to observe the children handling stress in the job. Head to one of the highest paying job as an actor at the Acting Academy. The kids would have a chance to perform for their parents at the end of their training. Be a pilot or a cabin crew in this highly realistic cabin set up. The kids actually get to train in a REAL decommission plane from Qatar Airlines. There are several roles you can do at Maybank. Be a service manger or wealth manager and serve clients. Otherwise be a cash officer and go around transporting cash from various outlets to the bank. Head down to the clock tower and prepare for a performance for the crowd when the clock strikes at every hour. Continue your love for performing by signing up as a city parade performer at the Acting Academy. Join as a tour guide at WTS Travel and bring tourist for a tour around KidZania in the tour bus. Want to manage a store? Be a junior cashier or store assistant. You can also choose to be a customer if you want. There are no payment made or given as a customer. The courier service crew looks suave in their blue uniform and yellow caps. Grab a trolley and start delivering the package to various units in KidZania. Be a Crime Scene Investigator and solve all the crimes in KidZania. There is a dummy patient waiting for junior dentist to operate on them. At the end of the activity, you might even take home a token toothpaste. Always wanted to be a host in a TV show, . The Discovery Film Studio is the place to go. Choose to be a video editor to edit a show instead if being in front of the camera is not your cup of tea. There are many jobs available at the boutique for kids. Want to be a supermodel? Take your chance here. Other roles such as visual merchandiser and fashion coordinator is available at Camouflage boutique. Join the SCDF fire fighters and save the city from the blazing flames. This is also a high demand job in Kidzania with waiting time in excess of an hour. My parents always wanted me to be doctor. I guess you could fulfill your parent's dream by being a surgeon at Mount Elizabeth. Other roles includes paramedic, baby expert and radiologist. Head to the 2nd floor and be a health researcher at Lifebuoy. Love to take photographs? Head down to Canon image academy to be a photojournalist. Ever wonder what goes on in an insurance office. Find out firsthand how you could be a financial services consultant. 2 jobs are available at The KidZania Post. The older kids can learn to be journalist while the younger ones would enjoy being Newspaper delivery crew. If you want to see clearly, head down to Nanyang Optical shop and be an optometry consultant. The first Peranakan Museum in KidZania worldwide. Head down to the intan museum to be a museum curator. Want to be live on air? Head down to Kiss 92 radio station and be a radio presenter. Want to know how radio works? Be a technical assistant to find out more. Go to Esso Station and be a Petrol station manager. Be a police officer and control the crowds at KidZania. There is a jail cell at the Police Station too... in case you managed to catch a crook. Be a junior scientist at Yakult science laboratory. The Sports Commentator Assistant is the best job for you! Kids love to eat Ba Kwa during Chinese New Year. At Lim Chee Guan , you can learn to make your own Ba Kwa. Not all jobs have a shop front. Jobs like the window washer requires you to wash shop fronts instead. Some roles pays KidZos, some require payment instead. Be a candy design trainee and make your own Sticky candy to take home. Be a chef at KFC and make your own chicken burger for lunch. Fancy being a climber? Try your skills at the climbing building. Learn to drive at the driving school and take to the streets when you are ready. Want to be a fashion model? First you have to learn the ropes. Be an ice cream maker and make your own ice cream. To be a photojournalist, you would need to be a photographer student first. Be a customer at the insurance officer and get your insurance for climbing buildings and Mountaineering School. Find out what job suits you at the job information center. Doll yourself up before you begin your career at Cést Moi makeup atelier. Be a mountaineer to conquer greater heights. Be a pizza chef and make your personalised pan pizza from Pizza hut. Want a healthy lunch , then join soup kitchen as an assistant soup chef to make your own bowl of healthy soup. Participate in a football game or a telematch at the stadium. Want to earn more KidZos for selected jobs, join the university to get your degree first. kids are not the only one that can participate in activities, adults get to join in the fun too. Be passengers at the aviation academy to be serve by the cabin crew. Be a tourist and head on a tour bus for a tour around KidZania. Parents can also be spectators and cheer for your favourite team at the stadium. If need too, parents can take a break at the parent's lounge while the kids roam Kidzania. Do note your child needs to be at least 9 years old to be alone at Kidzania. For children under 4, KidZania has a spot for them too on the Mezzanine floor. Join the Kindergarten for some arts and craft activities. You could also head to RightZkeepers Residence to play masak masak. The residence is made to look like a house and includes a ball pit too. Baby care facilities are also found in the same area. There is a kids only Kidzania's Department store where kids would spend their hard earn cash to choose their rewards in the department store. Do note, adults are not allowed inside to choose the gifts with the kids. The mini arcade is located in the heart of KidZania. Roaming photograpers from Kidzania would take your child photos around the KidZania. The photo codes are stored in the wristband. Do make a stop before you leave to check out exclusive photos of the kids. Photos are available for purchase for a fee. If you intend to have a party for your friends, you could book a room at the clubhouse. There are a total of 3 locations for booking. The whole KidZania can be booked too for corporate events. If you can find 1500 kids to celebrate birthdays with , you can technically opt to book the whole of KidZania too! There is a KidZania shop near the exit to get your Kidzania merchandise before you leave . Toilets are found indoor too, so you need not exit to find a restroom. 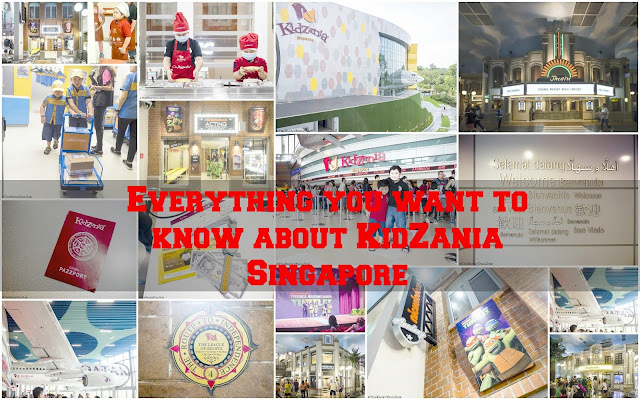 KidZania Singapore is a 2 storey 7600 square meters edutainment center. It is build to the scale of 75% of the real world and is cater for kids age 4-17. It can hold a maximum of 1500 people at anyone time. Kidzania has its own language. It may be a little confusing at first, but you would get used to words like Kai ( Hello) , Kidzos ( Money) and Z-u (See U). A theme park will not be complete without mascots, check out Urbano, Vita, Bache, Chika and Beebop. The kids learn the value of money. They learn that you need to work for your money before you can spend it. A valuable life lesson that can be learn through play. Surprisingly , the kids pays attention to the instructions during role play. Waiting in queues also helps to build up their patience. Activities in KidZania allows the kids to interact with adults in a safe environment. Parents can also observe their social skills through these interactions. Kids learn to choose their own occupation. In addition, if they are above 8 , they can go about doing these role plays on their own. Is it their route to Independence. Kids can a glimpse of the different jobs adult does. Maybe this will inspire them to choose a career for themselves in the future. Last but not least, kids would learn that hard work pays off. At the end of the day, they can change their hard earn KidZos for a gift of their choice in the department store. For a family of 4 , expect to foot out a whopping $186 per visit. Entrance fee is not cheap in KidZania, especially when adults have to pay a fee for minimum participation. Nonetheless, you can maximize your cost with activities such as chef that allows the kids to make their own lunch using KidZos instead of cash. Alternatively get your discounted tickets from Klook here! We had finally come to an end to this review. KidZania is surprisingly a very fun place for kids to explore. Do go with a friend as it will definitely double the fun. Wait time can be pretty long, so we do suggest a weekday visit, especially during the school holidays! The Wacky Duo were invited for a day out at Kidzania. All opinions are of our own. I found about Kidzania thanks to your blog post. Before I didn’t know that a place like that exists in the world. And I think it is very beautiful idea to let kids experience their dreams. It is like educational program for kids to understand better what it feels to be an adult. I liked the fact that they give kids awards. It is like encouraging them to keep going for their dreams. And, also, awards make kids to be better because they know that others recognized them. Kidzania’s idea is very simple, but very deep and beautiful. I wonder how they come with that idea. I could say that is better than Disneyland or Legoland. I wonder if places like that exist in other countries too. Maybe I should research about it. Kidzania is all over the world. It was our first time there but after the trip, we would probably add this to our list when we travel overseas :) you can find out more at their website. Activities some are good some forced. But waiting time is just unreasonabe. It's impossible to get much done even in 6-8 hour's, barely 3-5 activities out of over 25 activities listed for marketing purpose. It's not worth the price. To top that infant 2-3 years have just one indoor small activity center allowed for age and size for 25$ not worth it at all. Paren't pay 35$ for what? Not a very happy patron. Thank you for the review. A friend recommended a family day out with his girls and my girl. Hope my girl will enjoy still though she is 4 only. Your tips to get pazzport and BKidzanian sound like a good advice. Will do that.